Carb cycling is a method of dieting that involves planned increases and decreases in carbohydrate intake throughout the week. Carb cycling can help you lose fat and build muscle if it helps you better stick to your diet, but it doesn’t have any special fat-burning or muscle-building properties. For carb cycling to work, you also need to set and track your calories correctly and follow a carb cycling meal plan (which you’ll learn how to do in this article). I don’t know about you, but I like simple. You don’t need to do anything particularly special or fancy to build the body of your dreams. At least 80% of the game is just understanding and applying a relatively small number of physiological principles related to diet and exercise. And I’d go as far as saying that the majority of what’s left is just patience and persistence. You don’t need fancy training programs or crash diets. You need fundamentals. You know, energy balance, macronutrient balance, progressive overload, consistency, and the like. That said, once you have the fundamentals firmly in place, you can go after that last 20% of the game. This is where things like supplementation, fasted training, periodization, and carb cycling come into play. As the name suggests, carb cycling involves eating more carbs on some days and less carbs on other days, and there are many different opinions on its merits and methods. Some people say eating carbs has benefits but also significant drawbacks, and carb cycling allows you to enjoy the former and minimize the latter. Others say carb cycling is an effective way to lose fat faster while retaining muscle when you’re cutting. And others say that carb cycling is only helpful if it helps you better stick to your diet or if you’re an athlete who’s trying to follow an extremely low-carb diet like the ketogenic diet. The short answer is that carb cycling can indeed make it easier to build muscle while staying lean—but not for the reasons most people claim—and it can also make it easier to stick to your diet while cutting. In this article, we’re going to dive deep into carb cycling and learn what it is, how it (supposedly) works, what the benefits and drawbacks are, and how to do it. Is carb cycling better than plain ol’ flexible dieting? That is, is it better than following the same meal plan every day for building muscle and losing fat? Is Carb Cycling Good for Weight Loss? Is Carb Cycling Good for Building Muscle? Carb cycling is a method of dieting that involves planned increases and decreases in carbohydrate intake throughout the week (and generally in calorie intake as well). High-carb days typically call for 2 to 2.5 grams of carbohydrate per pound of body weight or 50+% of calories from carbs. They’re usually your highest calorie days. Low-carb days typically call for about 0.5 grams of carbohydrate per pound of body weight or 20+% of calories from carbs. They’re usually your second-highest calorie days. No-carb days typically call for less than 50 grams of carbohydrate or less than 10% of calories from carbs. They’re usually your lowest calorie days. If all that sounds complicated to you, that’s because, as far as dietary strategies go, it is. You need to be meticulous in your meal planning and steadfast in your compliance. So, if carb cycling has a lot of moving parts and may turn you into a manic depressive, why do people do it? We’re often told that carbs are a double-edged sword. On one hand, they’re conducive to muscle growth by fueling our workouts and creating a more anabolic environment in our bodies. On the other hand, they’re conducive to fat storage by spiking insulin levels, which “feeds” our body fat with precious glucose for it to store. We need carbs if we want to gain muscle and strength as quickly as possible . . . but we have to pay the price of an ever-expanding waistline. Enter carb cycling, which we’re told can deliver most or all of carbs’ muscle-building benefits with little or none of its fat gain drawbacks. Replenish glycogen stores and thus boost training intensity. Favorably influence various hormones related to muscle protein synthesis and metabolism. Temporarily elevate insulin levels to help preserve muscle tissue and boost muscle growth. And then, you use lower-calorie low- and no-carb days to maximize fat burning. This solution is particularly appealing to people on a ketogenic diet, which normally involves eating less than 50 grams of carbs per day. By adding some high-carb days into the mix, the entire experience can become more enjoyable. Theoretically, then, carb cycling should allow us to build muscle while gaining little to no fat or, even better, build muscle and lose fat at the same time. And now you understand why carb cycling is so popular these days. It sounds like a miracle. Unfortunately, though, upon closer inspection, it’s more a mirage. To find out why, let’s start with carb cycling’s biggest claim to fame: rapid fat loss. Can you use carb cycling to lose weight? Any dietary protocol that has you in a calorie deficit over an extended period of time will result in weight loss, regardless of the foods you eat or how you structure your meals or anything else. So long as you regularly eat less energy than you burn, you’re going to lose weight. And that’s when the wheels start to fall off. To understand why, we have to first make a distinction between weight loss and fat loss. When you diet to lose weight, a portion of the weight lost comes from fat, but a portion also comes from water, glycogen, and, in some cases, muscle. Water and glycogen levels will fluctuate up and down depending on your diet and other factors, so we don’t really care about that. The real goal is to lose fat and not muscle. That’s what improves our body composition. What does this have to do with carb cycling, you wonder? Well, at its core, carb cycling is a carbohydrate-restricted diet, and while it may help you lose weight faster, it isn’t going to help you lose fat faster. That is, if a traditional “40/40/20” bodybuilding diet would have you eating, let’s say, 1,500 grams of carbohydrate per week, a carb cycling diet might peg your intake at half that or less. And while low-carb diets can, in the short term, beat out traditional diets in terms of weight loss (but not always), they don’t result in greater fat loss. Yes, you read that right. Low-carb diets are not inherently better for fat loss than their higher-carb counterparts. Sure, there are exceptions (certain metabolic disorders, for example), but the above holds true for normal otherwise healthy people. If that sounds blasphemous to you, I understand, but a sober review of the literature makes this abundantly clear. Low-carb evangelists often point to a number of studies as definitive proof of the superiority of their ways. This, this, and this are fan favorites. A glib review of such studies would lead you to believe that low-carb dieting is indeed more effective for fat loss, but a critical review of the research shows otherwise. There’s a big problem with many of these studies, and it has to do with protein intake. Namely, the low-carb diets in these studies invariably contained more protein than the high(er)-carb ones. That means that what we’re actually looking at is a high-protein, low-carb diet vs. a low-protein, higher-carb diet . . . and the former will result in more weight and fat loss every time. Why is that, though? Is it because the carb intake is lower or because the protein intake is higher? Well, there are several studies that answer that question for us. Research shows that when protein intake is high and matched among low- and high-carb diets, there’s no significant difference in weight loss. That is, if you eat enough protein, going low-carb as well offers no special fat loss benefits. Group one followed a ketogenic diet that ate about 30 grams of carbs per day. Group two followed a higher-carb diet that ate about 160 grams of carbs per day. For six weeks, both groups ate 1,500 calories per day from the same foods, did the same amount of exercise, and more or less lived under identical conditions. Unlike the studies touted by low-carb zealots, the scientists in this study designed the participant’s meal plans so that both groups would consume the same amount of protein. Now, it’s worth mentioning that the protein intake was still fairly low for both groups (only about 120 grams, or ~0.5 grams per pound per day). This probably wasn’t enough to get the full benefits of a high-protein diet, but the important thing is that both groups consumed the same amount of protein per day, so neither would benefit more from protein intake than the other. Thus, with protein intake matched between both groups, any differences in weight or fat loss could be reasonably attributed to differences in carbohydrate or fat intake. This study’s methodology was rigorous, too. All meals were prepared by the scientists, and from the beginning to the end, everything eaten was recorded along with careful measurements of their calorie, macronutrient, and vitamin and mineral intakes, as well as their body composition. The outcome? Surprise, surprise, there was no significant difference in muscle or fat loss after six weeks between the two groups. And ironically, much to the low-carb zealot’s chagrin, there was a slight trend for the people in the high-carb group to lose slightly more fat. Furthermore, toward the end of the study, the group following the ketogenic diet also reported they felt worse, had less energy, and were less motivated to get up and move around. The reason both groups lost the same amount of weight was they ate the same number of calories, and the reason both groups lost the same amount of fat is because they ate the same amount of protein. How can this be, you wonder? What’s so special about protein? One of protein’s weight loss advantages has to do with something known as the thermic effect of food, or TEF. This is the amount of energy required to eat, digest, absorb, and store food, and research shows that it accounts for about 10% of total daily energy expenditure (TDEE). The total energy expenditure from TEF varies based on the macronutrient composition of the diet because protein, carbohydrate, and dietary fat all have different TEF values. Research shows that protein costs the most energy to process (30 to 35%), carbohydrate costs significantly less (5 to 15%), and dietary fat costs the least (0 to 3%). This is one of the reasons why high-protein diets are so effective for fat loss (it’s also why high-fat meals result in more immediate body fat gain than high-carb meals). You see, when a considerable amount of your daily calories come from protein, a considerable amount of that energy is expended through TEF, which helps you maintain a calorie deficit. Another reason for protein’s preeminence is the fact that eating too little while dieting to lose fat can result in a considerable amount of muscle loss. It causes your basal metabolic rate to drop. It reduces the amount of calories you burn in your workouts. It impairs the metabolism of the food you eat. If you want the best possible results when dieting to lose fat, you want to eat plenty of protein. With that in mind, let’s swivel our spotlight back to the flawed low-carb studies I mentioned earlier. We already know that the low-carb groups were eating more protein than the high-carbers, but how much more exactly? Well, in many cases, the high-carb groups were eating far less—less than even the RDI of 0.8 grams of protein per kilogram of body weight, which studies have shown is woefully inadequate for preserving muscle mass. In fact, research shows that double and even triple the RDI amount isn’t enough in many cases. So, given all the above, we shouldn’t be surprised that high-protein, low-carb diets are superior for weight loss compared to low-protein, high-carb diets. You might still be reeling from the fact that high-protein, high-carb diets work equally well, though. Don’t carbs spike insulin levels, and doesn’t insulin spike fat storage? Well, while that’s a physiologically accurate statement, it’s used to mislead millions of people into fearing insulin and carbs. One of the easiest ways to invent a fad diet is to isolate some aspect of nutrition and finger it as the root cause of major problems or deliverance from them. Lectins are the bogeyman of The Plant Paradox diet, “toxins” are the bugbear of detox diets, and “acidic foods” are the bane of the alkaline diet. For the low-carb crowd, insulin is the great bugaboo; the evil hormone programmed to make us fat, type II diabetics. And the carbohydrate, we’re told, is insulin’s trojan horse and partner in crime. We eat the delicious carbs, and they open the insulin floodgates and chaos ensues. Well, like much of the nonsense foisted on us by magazines, trainers, and “gurus,” the “insulin makes us fat” story is nothing but an urban legend used to scare the kiddies. Insulin doesn’t make you fat. Overeating does. Full stop. To understand why this is, let’s jump to square one: what is insulin and how does it work? Insulin is a hormone that shuttles nutrients from your blood to your cells. When you eat food, it gets broken down into various substances like amino acids, glucose, and fatty acids. These all make their way into your bloodstream, and are joined by insulin, which is produced by the pancreas. As the nutrients make their way into cells, your body gradually reduces insulin levels until everything is absorbed. Insulin then remains at a low, baseline level. This cycle occurs every time you eat food, and thus your body’s insulin levels are constantly rising and falling throughout the day. When explained like that, insulin sounds like a pretty cool dude. We can’t live without it. Why, then, are we told it makes us fat and sick? Because one of its roles in the body relates to fat storage, and that makes it an easy target. Specifically, insulin inhibits the breakdown of fat cells and stimulates the creation of body fat. That is, it tells the body to . . .
Stop burning fat and burn the energy readily available from the food you ate instead. Store a portion of the energy that’s available as body fat. And yes, that sounds bad, which is why it’s an easy scapegoat. This sounds reasonable but is deeply flawed, mainly because it violates the principles of energy balance. Energy balance is the relationship between how much energy you eat and how much you burn. This relationship determines weight change over time and takes precedence over anything related to insulin or any other hormones. Simply put, you can’t gain a significant amount of fat without providing your body with a surplus of energy to store as fat. And you can’t lose a significant amount of fat without keeping your body in a significant energy deficit, forcing it to whittle down its fat stores to stay alive. This helps us understand why studies show that, so long as protein intake is matched, people lose fat equally well on high-carb and low-carb diets. The takeaway is simple: if there’s an adequate calorie deficit, carbohydrate intake and insulin levels have little bearing on fat loss. The ne plus ultra of this scientific reality is Professor Mark Haub’s weight loss experiment wherein he lost 27 pounds on a “convenience store diet” consisting mainly of protein shakes, Twinkies, Little Debbie cakes, Doritos, and Oreos. He fed his body less energy than it burned and it had no choice but to tap into its fat stores, regardless of how unwholesome the food was. It’s also ironic to note that eating protein, which we already know is conducive to weight loss, significantly raises insulin levels as well. In fact, high-protein, low-carb meals can cause more insulin production than high-carb meals, and beef produces a similar insulin response to brown rice. Does carb cycling help you lose fat faster? The answer is no, of course, because eating fewer carbs on some days and more on others (and eating fewer in general) isn’t going to significantly impact your fat loss. The two factors that are going to are your protein intake and energy balance. That said, this doesn’t necessarily mean you shouldn’t cycle your carbs when you want to lose weight. Some people simply prefer to eat fewer carbs and more dietary fat when they’re cutting, in which case carb cycling can be more enjoyable. If you’re cutting on very few calories and your fat intake is already low, reducing your carbs to lower levels a few days per week and eating more fat for a few days can make your diet more enjoyable. Although it doesn’t offer any metabolic advantages, it doesn’t harm anything either, so if it’s going to help you keep your diet on track, that’s valuable. Can you use carb cycling to build muscle? So long as you’re eating enough food and you know what you’re doing in the gym, you can build muscle. Does carb cycling offer any special muscle-building benefits, though? Unfortunately, it doesn’t. In fact, it’s less suitable for building muscle than traditional dieting because of its restrictions on carbohydrate intake. Simply put: when you want to build muscle, you want to eat large amounts of carbohydrate. The first has to do with glycogen, which is a form of carbohydrate stored in the muscles and liver. High-carb diets help maintain high levels of glycogen in the body, which improves workout performance. And the more strength and energy you have for your workouts, the better you can progressively overload your muscles, which leads to muscle growth. Carbs’ insulin effects help with muscle building as well. Insulin isn’t anabolic like other hormones such as testosterone, but it does have powerful anti-catabolic properties. This means that insulin decreases the rate at which muscle proteins are broken down, which creates an internal environment more conducive to muscle growth. And this is why several studies have shown that high-carb diets are superior to low-carb for building muscle and strength. For example, one study conducted by scientists at Ball State University found that low muscle glycogen levels (which is inevitable with low-carb dieting) impairs post-workout cell signaling related to muscle growth. Another study conducted by scientists at the University of North Carolina found that when athletes followed a low-carb diet, resting cortisol levels were higher and free testosterone levels were lower. As cortisol is a catabolic hormone and testosterone an anabolic one, this is the exact opposite of what we want. These studies help explain the findings of other research on low-carb dieting. For instance, a study conducted by scientists at the University of Rhode Island looked at how various levels of carbohydrate intake influenced exercise-induced muscle damage, strength, recovery, and protein metabolism after a strenuous workout. Group one followed a high-carb diet that provided 343 grams of carbs per day. Group two followed a low-carb diet that provided 226 grams of carbs per day. Both groups followed their diets for five days, after which everyone performed an intense weightlifting session designed to cause large amounts of muscle damage. The scientists measured everyone’s levels of muscle protein synthesis before and after following their respective diets, and again after the workout. The people who followed the low-carb diet lost more strength, recovered slower, and showed lower levels of muscle protein synthesis than the people who followed the high-carb diet. And keep in mind the “low-carbers” in this study experienced these negative effects while still eating a fair amount of carbs every day—quite a bit more than most low-carb proponents would recommend. Finally, another study conducted by scientists at McMaster University compared the effects of high- and low-carb dieting on subjects doing daily leg workouts. They found that people following a low-carb diet had higher levels of muscle protein breakdown, lower levels of muscle protein synthesis, and built less muscle than the people following a high-carb diet. This is why I generally recommend a high-carb diet for gaining muscle and strength, and why carb cycling can be counterproductive for building muscle. That said, just because it isn’t optimal doesn’t mean you shouldn’t do it. As I mentioned earlier, you might find that you simply enjoy eating more fat instead of carbs while lean bulking, in which case carb cycling might be a good fit for you. Now that we’ve put carb cycling in perspective and adjusted your expectations to reality, let’s talk about how to actually do it. You’ll often see regimens with a day of fewer than 50 grams of carbs (a no-carb day), but this makes compliance significantly harder in exchange for few practical benefits, which is why I don’t recommend or do this myself. With that in place, let’s look at how to set everything up for both losing fat and building muscle. When you’re carb cycling to lose fat, you will have five low-carb days and two high-carb days. Where you place your high-carb days doesn’t matter much and you can move it around week to week, but I like to place them on or before the days of my hardest workouts. Remember that when you’re carb cycling, you still have to plan and track your calories and macros if you want to guarantee results. The starting point for determining where your food intake should be is your total daily energy expenditure (TDEE). If you’re not sure what this is and how to calculate calorie deficits, read this article. On your low-carb days, you should be in a 25% deficit. On your high-carb days, you should be in a 10% deficit. For example, my TDEE is currently about 3,000 calories, so my low-carb day’s calories would be around 2,250, and my high-carb days would be around 2,700. Let’s now look at how those calories translate into macronutrients. Your protein intake should remain at 1 gram per pound of body weight (or 40% of total calories if you’re over 20% body fat as a man or 30% body fat as a woman). On your high-carb days, get 50% of your calories from carbs. On your low-carb days, get 20% of your calories from carbs. Get the rest of your calories from fat. Once you have your numbers worked out, simply create a meal plan for both days and stick to them, alternating according to the rotation I shared above (two high-carb days and five low-carb days per week). If you want to use carb cycling to bulk or maintain your current body composition, you want to make a few changes to both your calories and macros. First, I recommend 4:3 ratio of high-carb days to low-carb days. That is, four high-carb and three low-carb days per week (seven days). The low-carb days will help reduce water retention, making you look leaner, and the additional high-carb day helps with your training and muscle gain or retention. The low-carb days also allow you to eat more fat and protein, if that’s what you prefer. Your low- and high-carb days don’t have to be lined up in a row. 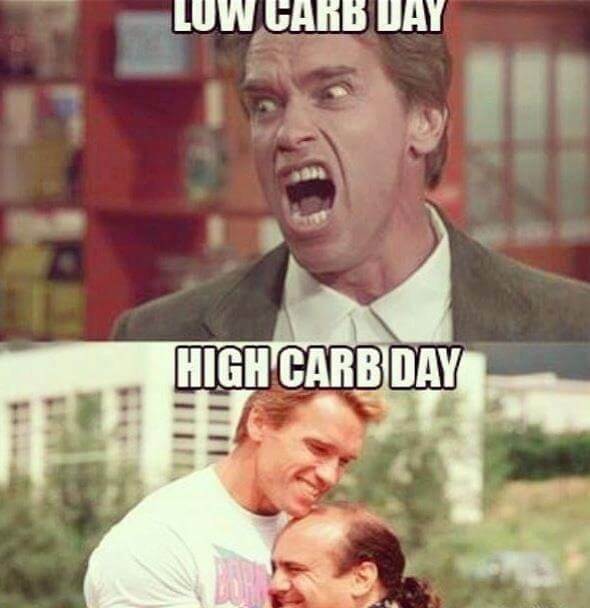 Some people like to follow three low-carb days with four high-carb days, and others like to stagger them based on how they’re feeling in the gym, doing let’s say two high-carb days, one low-carb day, two high-carb days, and two low-carb days. If you train in the evening, I recommend you schedule most of your high-carb days to fall on days you’re lifting weights and most of your low-carb days on days you aren’t (although some of your training days will probably be on low-carb days). If you train first thing in the morning, as I do, or in the afternoon, I recommend you ensure high-carb days precede your training days as much as possible, as this will allow time for your muscle glycogen levels to rise and will have a more positive impact on your performance. If you’re maintaining, set your daily intake to 100% of your TDEE. Your protein intake should always remain at 1 gram per pound of body weight. On your low-carb days, get 25% of your calories from carbs. Once you have your numbers, all you have to do is create a meal plan and stick to it. If you’re coming from the low-carb or keto crowd and aren’t sure how to set up a diet with this many carbs, I understand. One of the most challenging aspects of following any kind of cyclical diet where your meal plan and macros change throughout the week is figuring out what foods on which days to eat to hit your numbers. That’s why I’m going to give you some of my personal favorite high-carb foods that I use when setting up a high-carb menu for myself or my clients. And then, of course, I like to save treats such as ice cream, chocolate, jam, and pancakes for my high-carb days as well. Most carb cycling protocols involve high-carb days where you eat a large portion of your daily calories in the form of carbs, and low-carb days where you cut your carb intake and eat more protein and fat. The central premise of most carb cycling diets is that carbs are a double-edged sword for improving body composition. As the story goes, carbs are conducive to muscle growth by fueling our workouts and creating a more anabolic environment in our bodies. Unfortunately, they’re also conducive to fat storage by spiking insulin levels and providing an abundance of glucose to store as body fat. This is false. The dietary factors that dictate how much weight and fat you lose while cutting are simply how many calories and how much protein you eat. Attempting to keep insulin levels low by carb cycling or low-carb dieting isn’t going to help you lose fat faster and, ironically, eating protein stimulates insulin release as much or more than carbs. When it comes to muscle growth, you’ll generally gain more muscle and strength following a high-carb diet rather than a low-carb diet, and carb cycling doesn’t provide any muscle building advantages. That said, if you prefer to eat more protein and fat some days of the week while cutting or lean bulking, there’s nothing wrong with carb cycling if it helps you stick to your diet better. If you want to lose fat using carb cycling, I recommend a low-carb to high-carb day ratio of 5:2, with five low-carb days and two high-carb days per week (seven days). You should be in a 25% calorie deficit on your low-carb days and a 10% calorie deficit on your high-carb days. If you want to gain muscle and strength using carb cycling while gaining or maintaining your body weight, I recommend a high-carb to low-carb day ratio of 4:3, with four high-carb days and three low-carb days per week. If you’re lean bulking, set your daily intake to 110% of your TDEE. Once you have your numbers figured out, you just need to make meal plans for your low- and high-carb days, and stick to them. Do that, and I promise you’ll be happy with how your body changes. What’s your take on carb cycling? Have anything else to share? Let me know in the comments below!